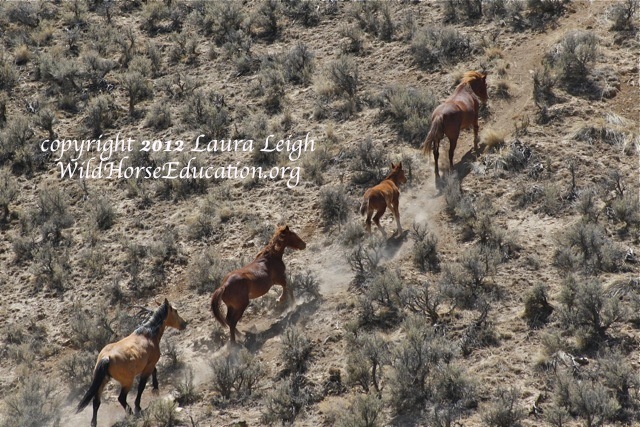 On April 3, 2013 Laura Leigh of Wild Horse Education (WHE) went to the Northern Nevada Correctional facility to visit with the 30 (plus 2) wild horses being held for release back into the Diamond Complex. Considering the area that they came from (Battle Mountain portion of the Complex) that was seriously compromised and the severity of the winter, these horses are doing very well as they await their return to the range. Final numbers are being determined for return to the range after treatment with PZP-22, a birth control agent. 792 were taken into corrals. Originally 603 were planned for removal. Wild Horse Education did survey work of the area. A report can be found within a previous blog post here: http://wheblog.wordpress.com/2013/01/18/diamond-roundup-begins/ the link also has a video showing Boyd Spratling, BLM Wild Horse and Burro (WH&B) Advisory Board chair AND livestock interest for the Nevada Department of Agriculture (NDoA), giving a ‘report’ and asking that NDoA request the BLM remove all wild horse populations in the state to low “AML.” We highly suggest you download the WHE report and watch Boyd Spratling speak in his capacity at the Dept of Ag. (should this man be allowed to sit on the WH&B Advisory Board?). The roundup is over. 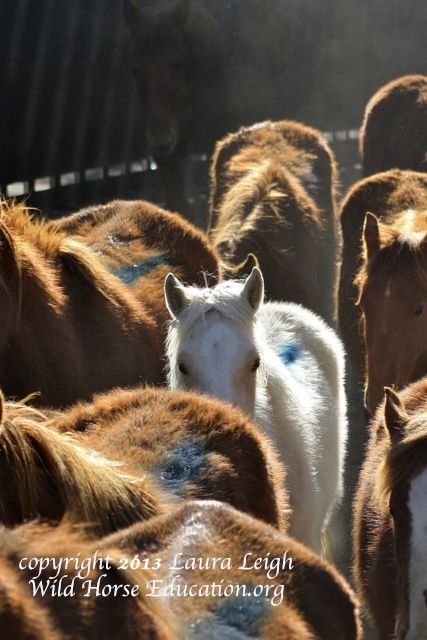 It is time to begin the discussion on what actually is a defined VIABLE USE as mandated under law (FLPMA and the WH&B Act) of wild horses on the range? What resource is required to sustain that use as outlined by law? And to recognize that multiple use is not being followed when a population within an HMA exists below that viability standard. It’s the law. Many of the horses that arrived at Palomino Valley Center (PVC) from the Battle Mountain portion of the Complex looked compromised (horses from the Ely/Elko areas look normal for February, remember this range has many, many fences). Considering the extensive over use for decades by certain users, the drought and the historically manipulated laws… the horses look better than expected. We watched them as they transitioned to feed. BLM, in the Battle Mountain District portion of the Complex that is shared by Ely and Elko districts, restricted livestock use and monitored animals. They took some pro-active action during last summers drought and should be applauded for the effort. However now it’s time to correct the mistakes that get us to these places so they never happen again. Use restrictions remain in place yet must be monitored closely to make sure they allow the range to recover. If they do not the livestock restrictions need to be expanded. 19 yearlings were offered for adoption at the fire station in Eureka after the roundup ended. 11 horses were adopted and 8 shipped to PVC.